The Museum of New Zealand Te Papa Tongarewa is the national museum and art gallery of New Zealand, located in Wellington. It is branded and commonly known as Te Papa and Our Place; "Te Papa Tongarewa" is broadly translatable as "the place of treasures of this land". The museum's principles incorporate the concepts of unified collections; the narratives of culture and place; the idea of forum; the bicultural partnership between Tangata Whenua and Tangata Tiriti; and an emphasis on diversity and multidisciplinary collaboration. In January 2013 Te Papa management announced the museum would be split into two parts – one operating much as it has in the past, and the other focusing on the future. For Te Papa's version of their history see their website. The first predecessor of Te Papa was the Colonial Museum, founded in 1865, with James Hector as founding director. It was built on Museum Street. Halfway through the 1930s the museum moved to the new Dominion Museum building in Buckle Street, where the National Art Gallery of New Zealand was also housed. The National Art Gallery was opened in 1936 and occupied the first floor of the National Art Gallery and Dominion Museum building on Buckle Street, Wellington. It was originally populated with a collection donated by Academy of Fine Arts. The Gallery was formed with the passing of the National Art Gallery and Dominion Museum Act (1930). Both the Dominion Museum and Gallery were overseen by a single board of trustees. The official opening was by the Governor General in 1934. The early holding consisted largely of donations and bequests, including those from Sir Harold Beauchamp, T. Lindsay Buick, Archdeacon Smythe, N. Chevalier, J. C. Richmond, William Swainson, Bishop Monrad, Sir John Ilott, and Rex Nan Kivell. In the early 1990s, Hamish Keith was involved in a public dispute about his role in the National Art Gallery of New Zealand's controversial purchase of two paintings by Charles Goldie. 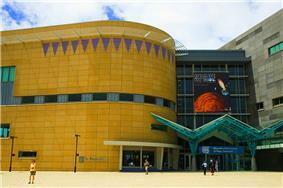 Te Papa was established in 1992 by the Museum of New Zealand Te Papa Tongarewa Act 1992. The official opening took place on 14 February 1998, in a ceremony led by Sir Peter Blake, Prime Minister Jenny Shipley, and two children. The first Chief Executive of the Museum was Dame Cheryll Sotheran. Māori traditional instrumentalist Richard Nunns co-led the musicians at a dawn ceremony on opening day. The museum is run by a Board appointed by the Minister for Arts, Culture and Heritage (currently Chris Finlayson). Board members have included: Sir Wira Gardiner, Fiona Campbell, Sue Piper, Judith Tizard, John Judge, Miria Pomare, Michael Bassett, Christopher Parkin Sandra Lee, Ngatata Love, Sir Ronald Trotter, Glenys Coughlan, Judith Binney Philip Carter and Wendy Lai. The museum had one million visitors in the first five months of operation, and between 1 and 1.3 million visits have been made in each subsequent year. In 2004, more space was devoted to exhibiting works from the New Zealand art collection in a long-term exhibition called Toi Te Papa: Art of the Nation. Filmmakers Gaylene Preston and Anna Cottrell documented the development of Te Papa in their film Getting to Our Place. 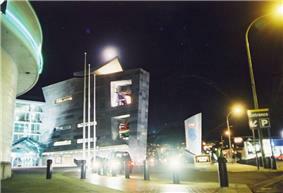 The main Te Papa building is on the waterfront in Wellington, on Cable Street. Inside the building are six floors of exhibitions, cafés and gift shops dedicated to New Zealand's culture and environment. The museum also incorporates outdoor areas with artificial caves, native bushes and wetlands. A second building on Tory Street is a scientific research facility and storage area, and is not open to the public. Te Papa was designed by Jasmax Architects and built by Fletcher Construction. The 36,000 square metre building had cost NZ$300 million by its opening in 1998. Earthquake strengthening of the Cable Street building was achieved through the New Zealand-developed technology of base isolation – essentially seating the entire building on supports made from lead, steel and rubber that slow down the effect of an earthquake. The site was previously occupied by a modern five-storey hotel. This was jacked off its foundations onto numerous rail bogies and transported 200 metres down and across the road to a new site, where it is now the Museum Hotel. Online access to Te Papa's collections is available at Collections Online. The History Collection includes many dresses and textiles, the oldest of which date back to the sixteenth century. The History Collection also includes the New Zealand Post Archive with around 20,000 stamps and related objects, and the Pacific Collection with about 13,000 historic and contemporary items from the Pacific Islands. There are significant collections of fossils and archaeozoology; a herbarium of about 250,000 dried specimen; a collection of about 70,000 specimen of New Zealand birds; significant amphibians, reptiles and mammals. The museum has the world's largest specimen of the rare colossal squid (Mesonychoteuthis hamiltoni). It weighs 495 kilograms (1,091 lb) and is 4.2 metres (14 ft) long. The squid arrived at the museum in March 2007 after being captured by New Zealand fisherman in the Ross Sea off Antarctica. The Archives are located in a separate building at Tory Street and are open for researchers on appointment. There are two categories of archive collections. The Museum Archive goes back to the founding of the Colonial Museum in 1865 and that comprise the archives of James Hector. The archives of the National Art Gallery are also part of these archives. a wide variety of archival material, that include the diary of Felton Mathew, Surveyor General at the time of the signing of the Treaty of Waitangi, and battle plans and correspondences related to World War I – for instance the Gallipoli diary of Captain E.P. Cox. Te Aka Matua Library, previously a publicly accessible library, is now open only to researchers by appointment between 10am-5pm, Monday-Friday. The library is a major research and reference resource, with particular strengths in New Zealand, Māori, natural history, art, photography and museum studies. It is located on the fourth floor of the main building. For current collections see the Te Papa website. Te Papa has a mixture of long term exhibitions of cultural objects, hands-on and interactive exhibitions, cultural spaces and touring exhibitions. The long term exhibitions of cultural objects focus on New Zealand history, Māori culture and New Zealand's natural world. The hands-on and interactive exhibitions focus on engaging particularly young visitors and include both indoor areas and out-door areas built and planted for the purpose. The key cultural space is the Te Hono ki Hawaiki marae with very impressive whakairo. All permanent exhibitions are free. Many of the touring exhibition are ticketed, but there are occasional free days. The museum has sometimes been the centre of controversy. The siting of significant collections at the water's edge on reclaimed land next to one of the world's most active earthquake fault lines has resulted in concern by some people. There has been criticism of the 'sideshow' nature of some exhibits (primarily the Time Warp section, which has since closed). There has also been criticism that some exhibits were not given due reverence. For example, a major work by Colin McCahon was at one stage juxtaposed with a 1950s refrigerator in a New Zealand culture exhibition. In March 1998, a 7 cm high statue of the Virgin Mary sheathed in a condom called Virgin in a Condom was exhibited, an art work by Tania Kovats which attracted protests by Christians. New Zealand art commentator Hamish Keith has been a consistent critic of Te Papa at different times referring to it as a "theme park", the "cultural equivalent to a fast-food outlet" and "not even a de facto national gallery" but seems to have moderated his opinion more recently when making a case for exhibition space on the Auckland waterfront. In August 2011, a collections manager of Maori artifacts at Te Papa - Noel James Osborne - avoided a charge of domestic assault after claiming it would hamper his international travel for the museum. ^ "Te Papa to split into past and future". 3 News NZ. January 28, 2013. ^ "Our history - Museum of New Zealand Te Papa Tongarewa, Wellington, NZ". www.tepapa.govt.nz. Retrieved 2015-06-18. ^ "Object: Colonial Museum | Collections Online - Museum of New Zealand Te Papa Tongarewa". collections.tepapa.govt.nz. Retrieved 2015-06-18. ^ "National Art Gallery Wellington - Te Ara Encyclopedia of New Zealand". teara.govt.nz. 2011. Retrieved 18 October 2011. ^ "Museum of New Zealand Te Papa Tongarewa Act 1992 No 19 (as at 25 January 2005), Public Act – New Zealand Legislation". legislation.govt.nz. 2011. Retrieved 28 July 2011. ^ "Biography". The Arts Foundation. Retrieved 24 September 2011. ^ "New Te Papa chair and board member appointed". scoop.co.nz. 2010. Retrieved 17 October 2011. ^ "Appointment to the Board of Te Papa Tongarewa". scoop.co.nz. 2008. Retrieved 17 October 2011. ^ "New appointments to Te Papa board announced". scoop.co.nz. 2009. Retrieved 17 October 2011. ^ "Lee and Love appointed to Te Papa Board". scoop.co.nz. 2007. Retrieved 17 October 2011. ^ "Appointments to Te Papa Tongarewa Board". scoop.co.nz. 2006. Retrieved 17 October 2011. ^ "New appointments to Te Papa Board". scoop.co.nz. 2010. Retrieved 17 October 2011. ^ "Toi Te Papa - International and New Zealand Art from Te Papa's collection". www.tepapa.govt.nz. Retrieved 2015-06-18. ^ "Getting to Our Place". 2011-07-17. Archived from the original on 2015-06-18. Retrieved 2015-06-18. ^ "Jasmax". Retrieved 28 April 2010. ^ "Building". Fletcher Construction. Retrieved 28 April 2010. ^ "Base Isolation" (PDF). Retrieved 2013-04-10. ^ "Collections Online - Museum of New Zealand Te Papa Tongarewa". collections.tepapa.govt.nz. 2011. Retrieved 28 July 2011. ^ The information in this chapter (and the following) is originally taken from the official website of Te Papa and from the “Te Papa Explorer”, a guide through the museum (no date, acquired March 2008). ^ Atkinson, Kent (May 1, 2008). "Size matters on 'squid row' (+photos, video)". ^ "Colossal squid may be headed for oven (Dead Link)". Yahoo! News (Yahoo! Inc.). 2007-03-22. Retrieved 2007-03-22. ^ "Object: Diary, Gallipoli | Collections Online - Museum of New Zealand Te Papa Tongarewa". collections.tepapa.govt.nz. Retrieved 2015-06-18. ^ "All exhibitions - Museum of New Zealand Te Papa Tongarewa, Wellington, NZ". www.tepapa.govt.nz. Retrieved 2015-06-18. ^ "Meeting house, Te Papa Tongarewa - First peoples in Māori tradition - Te Ara Encyclopedia of New Zealand". teara.govt.nz. 2011. Retrieved 17 October 2011. These carvings are on Te Hono ki Hawaiki wharenui (meeting house) in Te Papa museum. They show links to Hawaiki, the spiritual homeland from which the first arrivals to New Zealand came. ^ "See Te Papa’s masterpieces for free". scoop.co.nz. 2011. Retrieved 17 October 2011. Wellingtonians have the opportunity to see Te Papa’s latest temporary exhibition – The European Masters – on Thursday 3 February for free, thanks to Wellington City Council’s sponsorship of the museum. ^ Williams, Paul (May 2001). "Parade: Reformulating Art and Identity at Te Papa, Museum of New Zealand" (PDF). Open Museum Journal Volume 3: Policy and Practice. Retrieved 2008-03-27. ^ "Our Place needs biculturism not biased culturism". stuff.co.nz. 2011. Retrieved 17 October 2011. ^ Keith, Hamish (22 March 2008). "Te solution (Cultural Curmudgeon)". ^ Keith, Hamish (December 5, 2011). "Hamish Keith on museums". New Zealand Listener (3734). ^ "Te Papa manager avoids assault conviction". www.stuff.co.nz. ^ "No Right Turn: Rich man's justice". norightturn.blogspot.com. 2011. Retrieved 17 October 2011.